Having just gotten off the graveyard shift one morning, I stopped in at Dr. Sheehan’s office for some dental work. 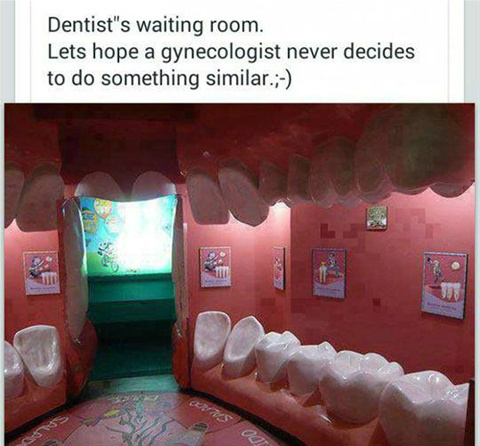 He’s a local dentist who is inexpensive and good at his job. Even if you didn’t like his work, you still could not walk away without liking him as a person. He’s really a special man and very likeable. Needless to say, since I had worked all night long, I was tired. After given a chair to sit in, Dr. Sheehan came to check my problem out. We had decided my wisdom tooth needed to come out, and soon. Since I had worked the night before, he offered to let me go home, get some rest and come back at a later date and have it pulled then. “Are you trying to get rid of me,” I asked jokingly. About thirty minutes into my slumber, the receptionist comes in and wakes me up. “You’re snoring really loud,” she explains. I didn’t get upset because I did agree to this. I could see he was overbooked and I chose not to leave until my problem was fixed. I couldn’t help it though and went back to sleep a third time. Every time I go into his office now, I think about that day and just laugh.